In August 2014, at age 48, I was literally in the best shape of my life. 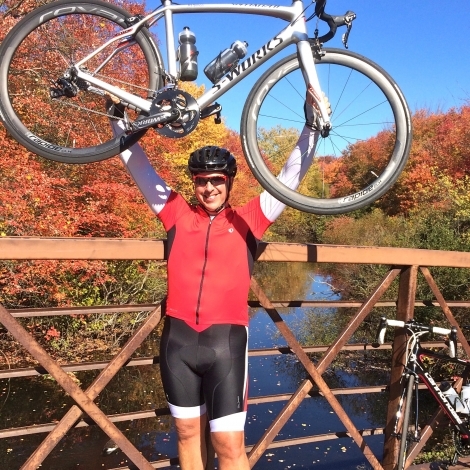 I was an avid cyclist, averaging more than 150 miles per week, leading groups of riders for my cycling club, and completing multiple 100-mile century rides in a single season. Over the course of just a few days, while cycling, I noticed a sudden setback in my performance. Virtually overnight I lost stamina, speed and endurance. Thinking I was battling a flu or virus I visited my doctor. Blood tests revealed an abnormality. Less than five days later I received the news, B-cell acute lymphoblastic leukemia (ALL). Like anyone, the news was traumatic and overwhelming, but with amazing support, I embraced the new challenge, pushed forward with a positive attitude and dedicated myself to learning and doing everything I could to fight. Thanks in part to clinical research of organizations such as the Leukemia and Lymphoma Society, I began a multiphase chemotherapy regimen that was developed for pediatrics that commonly battle ALL. This approach is improving outcomes for adult patients that are able to handle the rigor of the multiyear treatment. Over the course of the first 10 months of treatment, I spent more than 60 days in the hospital and endured four courses of chemotherapy. Now in remission, I am currently continuing a 30-month protocol of maintenance chemotherapy designed to help ensure the disease does not return. I am back to most “normal” activities, doing virtually everything I want to, back on my bike, and have my sites set on completing the treatment in January 2018. As part of my recovery, I advocate and support the efforts of LLS. I organized a local cycling event with more than 100 riders and raised awareness and funds for the Leukemia & Lymphoma Society. I credit my passion for cycling, the endless support of my wife (my angel on earth), family, friends and medical professionals as major contributors to my ongoing recovery.